SmartArt can do far more than merely decorating your slides. Discover the true potential of this useful tool to enhance your message effectiveness. 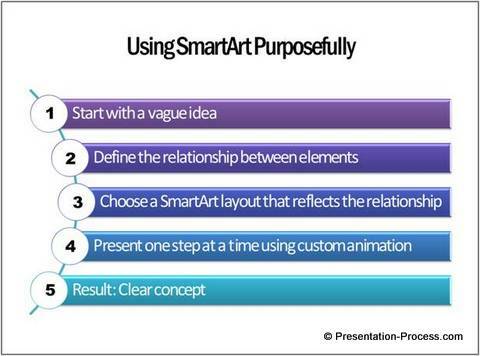 Are you using SmartArt Graphics just to decorate your slides? 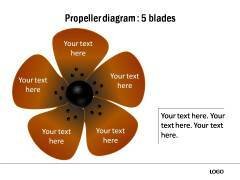 There is a big difference between visual presentations and decorated slide decks. 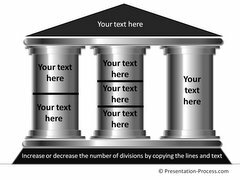 Boring bullet point slides don’t transform into visual presentations just because you converted them into SmartArt diagrams. For example, take a look at these two slides. Which of the two slides is visual? The second slide may be more colorful than the first. But, it is not making the slide any more visual than the first one. The issue is not with the tool. 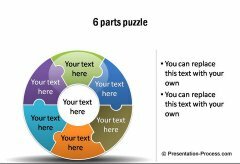 It is the way we use the tool that determines whether our message gets conveyed or gets ignored in a business presentation. 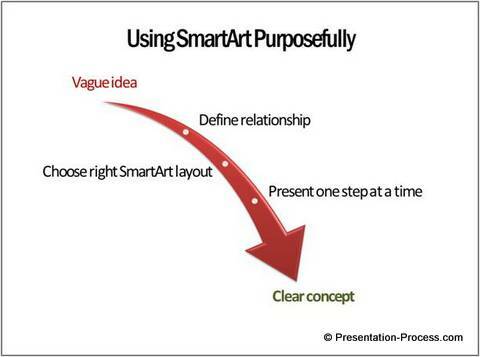 The one reason why most presenters fail to use SmartArt effectively is – they fail to define the underlying relationship in an idea clearly before choosing the SmartArt option. They get too absorbed in the ‘beauty’ of the layout, rather than the appropriateness of the layout. 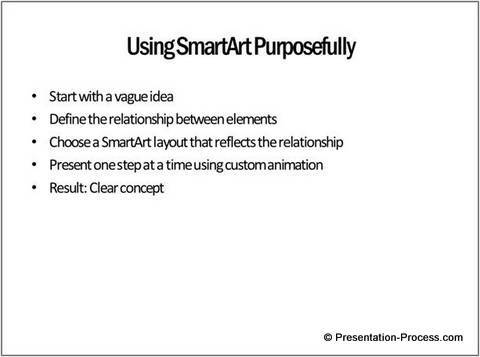 Before you even browse through the various SmartArt options, take a moment to go through your slide content carefully and see how the elements in your concept are related. 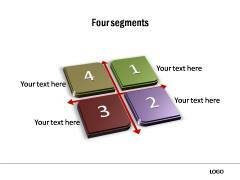 Match the relationship closely with the type of SmartArt layout you use. You will automatically choose the right option. Otherwise, if you browse through the layout collection first, you will be tempted to pick the one that looks ‘cool’, rather than one that reflects the relationship accurately. Let us work through an example to understand this better. The slide looks dull and boring. So, using SmartArt graphics is a good idea here. Here SmartArt doesn’t serve any purpose other than just decorating the slide. Let us take a moment to understand the content of the slide before choosing the layout. 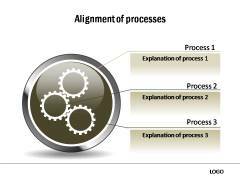 The content seems to be about ‘the steps involved in moving from vague idea to clear concept’. So, instead of blindly choosing a numbered list, we can choose the options under ‘Process’ layouts in the menu to depict ‘steps’. Here, the right layout helped us make our slide visual and clear. So, the next time you choose a SmartArt, take a moment to consider the underlying relationship. 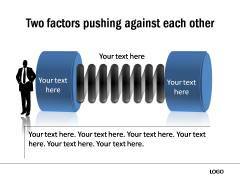 The closer you match your visual to your message; the better is your message effectiveness. If you make business presentations regularly, by now you would have realized that the number of options available to express relationships through SmartArt Graphics is limited. It takes a lot of time and effort to create diagrams that accurately reflect your ideas to your business audience. 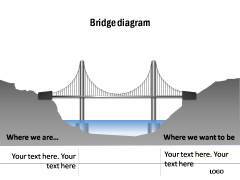 You just need to copy our diagrams to your slides and replace the sample text. 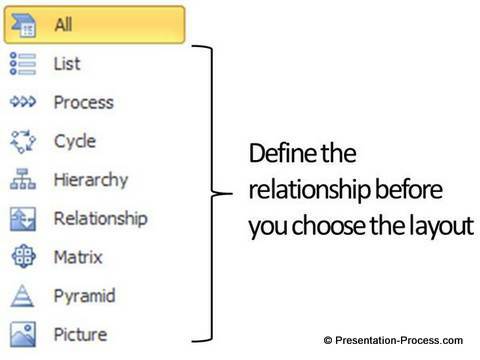 Your professional slide deck gets ready in minutes. 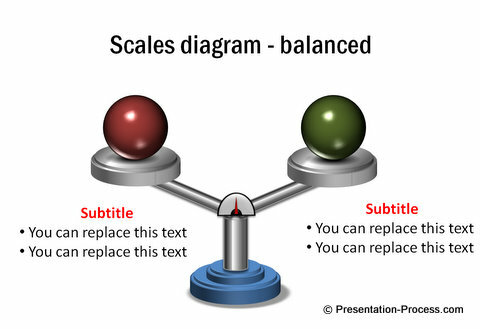 You have full control in changing the colors, size, shape, animation, bevel or any of the characteristics of the elements using the basic PowerPoint tools. In fact, you can pick elements from different templates and create custom diagram templates of your own to suit your specific needs. 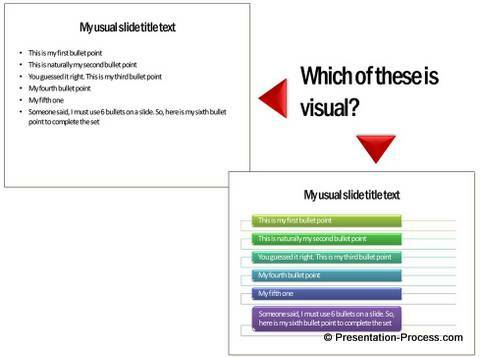 Creating professional slides for business presentations has never been easier.